Trail Riders 401 trail is Crested Butte’s most famous trail for good reason. 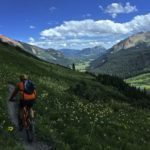 Lots of intermediate mountain bikers can be found spinning their way up to behold shoulder high flowers, fast single track, and heavenly views of Mount Crested Butte. Take your time, drink lots of water, and bring some sort of camera. It gets an intermediate plus rating due to the steep, but nontechnical climbing involved on 401, especially at the beginning. CBG Trails for iOS Devices.